The South Dakota portion of the Upper Minnesota River Basin (shown at left) includes three river systems; the Little Minnesota River, Whetstone River (North and South Forks), and the Yellowbank River (North and South Forks). These three rivers make-up the headwaters of the Minnesota River which starts near the South Dakota/Minnesota Border below Big Stone City, SD. The Little Minnesota River drains the northwest corner of Roberts County and a portion of east central Marshall County. The Little Minnesota River flows into Big Stone Lake south of Browns Valley, MN. The drainage includes hundreds of small named and unnamed tributaries that begin as small coldwater spring fed streams in the forested coulees located along the east escarpment of the Coteau des Prairie. One of the larger headwater tributaries, Big Coulee Creek flows from the escarpment into the Jorgenson River. Pasture and range make up the major land use along the escarpment where these small headwater tributaries begin. As these headwaters enter the Whetstone Valley the major land use changes to cropland. The Whetstone River starts at the confluence of it's North and South forks northeast of Milbank, South Dakota, running a short distance east where it joins the Minnesota River near the South Dakota/Minnesota border. The North Fork of the Whestone River drains the southern third of Roberts County. The South Fork of the Whetstone River drains the north half of Grant County and begins as several small spring fed streams located along the east escarpment of the Prairie Coteau. Lake Farley located in Milbank, South Dakota, is a small dammed reservoir located on the South Fork of the Whetstone River. 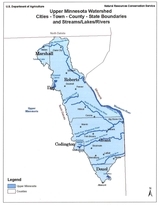 The North Fork of the Yellowbank River drains central Grant County and begins in the northeast corner of Codington County. The South Fork of the Yellowbank River begins in Deuel County and flows through the southeast corner of Grant County. The North and South Forks of the Yellowbank River join northwest of Bellingham, Minnesota eventually flowing into the Minnesota River near Odessa, MN. These small rivers are home to one of the most diverse population of fish and freshwater mollusks found in South Dakota including several rare species. Forty-six species of game and non-game fish have been collected in the rivers and small streams that make up the Minnesota River System in South Dakota, including the Blacknose Shiner listed as endangered and the Northern Redbelly Dace listed as threatened by the South Dakota Department of Game, Fish and Parks. Diverse populations of freshwater mollusks are also found in these rivers and streams. Thirteen species have been collected to date.